The leaves cracked to my left and held completely still. I realized that I was desperately holding my breath and so I slowly let it out. 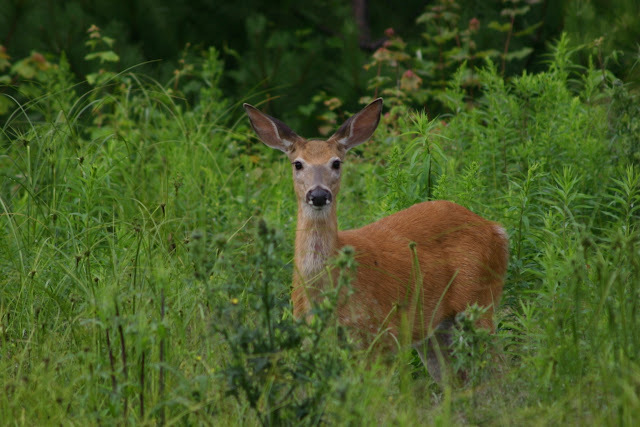 In the periphery of my vision I could see him, a young deer, taking steps toward me. He was looking me directly in the eye. There was no mistaking the direct, intense gaze of the creature. I had no idea what his thoughts were as he continued walking towards where I stood. I had been gathering wood for a campfire behind our cabin. Our friends from Anderson University had recently reached out to us and become significant partners with our work in Guatemala. We had been thrilled with their invitation to stay in their cabin in the woods, and this week... only a week before we leave the country... we find ourselves at a wonderful retreat. Retreat is a funny word. I think of retreat as soldiers running in panic as bullets zip past their heads and through their flesh. I think of retreat as a full on attempt to flee a bad situation... but that is not what retreat means to us today. This retreat is more of a strategic divergence... away from the in your face type of intention of of recent days. Each word of late has been measured. Every action has been weighed. When your days tick down to single digits... you realize how precious each moment has always been. We have goodbyes to make... embraces to hold, tears to be shed, and a mission to be told. And so we questioned this brief departure... was it right to pull our family away right before we make our permanent move? Sometimes you just have to jump. This was one of those gut type moments... you can’t really explain why, but you feel strongly compelled that it is just... right? I am relieved and content to say that yes, this was right. Our family of 5 has spent the last two days simply being together. Talking, playing games, gathering wood, cooking meals, enjoying those meals, speaking of dreams in the dark at the top of bunk-beds, these moments have been vital for us as a family to acknowledge the moment. Sterling is 17 months old. The longest she has ever stayed anywhere is the orphanage that saved her life. The closest thing to that was the basement of my parent’s home where we lived for nearly a year. The funny thing is... Kellie and I were discussing tonight, we have never left home. We have stayed in more places than we can count on our hands this past year... and still, home has always been wherever we are. God owns it all. We follow His plan. When we go where He tells us to go, well... then wherever we set our feet, wherever we lay our heads... the land is already His. Yes, the land is already His... and so we are home. I was talking to Caleb and Aleksandra tonight about fears and the unknown. Their young minds were grappling the concept of death. They had worries that were not so unexpected... what if the plane crashes, what if we have tough times ahead. Caleb mentioned Paul. He said, even Paul suffered terribly, so should we expect the same? I babbled on for a few minutes about statistics and how too many people perceive safety as a sure thing, and then I finally hit on the truth. Can you imagine that? You are walking beside the God who created everything? The God who spoke it into being. The God who created you and loved you so much that He allowed His own son to die to give you the chance for redemption! How can I not notice this and simply turn to gaze at Him? Have you ever looked a deer in the eyes? I have hunted and killed animals. I hold a concealed carry permit and am adequate with a firearm. But as I looked in the eyes of that young buck, I would not have pulled the trigger even if I had the shot lined up. We stood there, a mere 20 feet apart, the deer and I, considering each other. Kellie had gathered the 3 kids and I could hear them observing my encounter from the window in the cabin above. I imagined that time had stopped. I could hear the wind shifting individual leaves and I watched one slowly fall in the distance between me and the deer. We stood that way, simply considering one another for an indeterminate amount of time. Finally, he raised his hind left leg to scratch his fore-quarter. He snorted, observed me with a nod, flicked his white tail, and vaulted off into the foliage of the forest. He was gone. He had made his retreat. Sometimes you just have to jump. And I am fully aware that this is our moment. I think it is harder on our family than it is for us. I have no answer for this. I acknowledge that it is so difficult for our mothers and even our fathers that it takes their breath away and causes them real physical pain... and yet, I know that this is undeniably what we must do. All I can tell you is this simple fact that I found when talking to my children... there is no better place on earth than walking with your God. I am reminded again of that moment when the deer stepped in front of me, holding me in her deep gaze... this place and this moment are significant. Don’t miss the power of the present. In 6 short days we are off to fulfill our calling. I am confident in this walk. It is amazing to have the peace of mind to simply KNOW that you are exactly where you are to be. I thank God for these past two days, for these simply encounters. I want to look on His face with the attention and apparent peace that the deer had when he gazed at me. He will not harm us. He stands and shares this moment with us. After reading this, my father brought to my attention the fact of the small buds on the head of the deer. I had written the entire article calling him a her. Hopefully my hunting buddies & family members didn't notice. I think I have corrected the appropriate pronouns.